Product prices and availability are accurate as of 2019-04-12 12:08:33 EDT and are subject to change. Any price and availability information displayed on http://www.amazon.com/ at the time of purchase will apply to the purchase of this product. 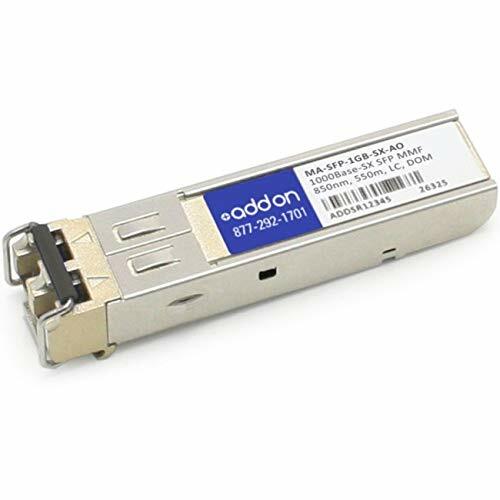 This cisco Meraki ma-sfp-1gb-sx compatible SFP transceiver provides 1000base-sx throughput up to 550M over multi-mode fiber (MMF) at a wavelength of 850nm using a LC connector. It is guaranteed to be 100% compatible with the equivalent cisco Meraki transceiver. This easy to install, hot swappable transceiver has been programmed, uniquely serialized and data-traffic and application tested to ensure that it will initialize and perform identically. Digital Optical monitoring (DOM) support is also present to allow access to real-time operating parameters. All of the transceivers are trade Agreements Act (TAA) Compliant.